Must not matter with workers out of work.. It's good to see the climate change debate becoming so measured and rational. 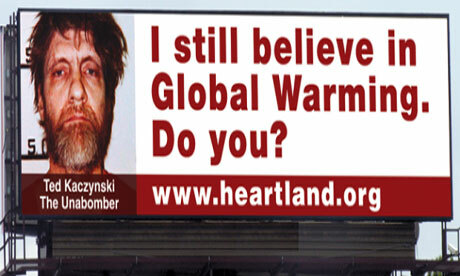 The upside is that the crazy shines with such glaring intensity from that billboard that backers are leaving the Heartland Institute. I really hope we're finally reaching the point where the rabid right is impaling themselves on the spear of their own crazy. In the meantime, I'm writing to Comcast to inform them that if they insist on continuing to fund Heartland, they have competitors who will gladly accept my $127.23/mo to provide comparable services. The Heartland Institute’s failed billboard campaign attacking the existence of climate change is driving a surge of corporate donors to abandon the group and prompting a mutiny among its Washington-based staff, which is decamping for less volatile surroundings, according to sources. At the center of the retreat is a contingent of insurance companies and trade groups that donated more than $1 million over the last two years to the libertarian group’s Center on Finance, Insurance and Real Estate in Washington, D.C., for programs related to federal insurance reform…. On a related note, I can't believe this is in Forbes. A hit piece on Watts, of famous denialist Ministry of Propaganda and Misinformation Watts Up with That fame. Ah… so that’s it. They’re victims in all of this. I’d have thought that if anyone is suffering battle fatigue, it’s the scientists and reporters who receive hate-mail and death threats fueled by Heartland’s campaign of distortion and innuendo. And here, I am floored this is in there. This is the same Zwick who recently ran afoul of the denial cranks when he suggested we ought compile a list now of who believes in the science and who does not. Admittedly not his greatest moment, but it sure got a rise out the denialist faithful. I'm frankly surprised Forbes didn't toss him for that one. Anyway, I like the way he wrapped it up here. But maybe Watts is onto something. Maybe Heartland is beginning to suffer something akin to battle fatigue. After all, it can’t be easy regurgitating all that pseudo-science year after year when people like Mann are out there generating solid research. Then there’s all the psychological dissonance they must be dealing with. That’s got to take a toll on their fake “think tank” soul. Think about it: if you were guilty of doing what they are guilty of doing, wouldn’t you feel kind of bad? Moar record warms for US of A. Odds - One in half a million. Does it Feel Warm in Here to You? "The fact that the U.S. has been in a warm pattern for several months is continuing to be the big story," Jake Crouch, who prepares the monthly climate reports for the National Oceanic and Atmospheric Administration, told msnbc.com. June 2011 through May 2012 "broke the record for warmest consecutive 12 months, which we just broke last month" with May 2011 to April 2012. Moreover, each of the last 12 months ranked in the top third of the historical distribution -- the first time that's happened in 117 years of record keeping. "If we assume that each month has an equal chance of having temperatures in the top third," Crouch said, "the odds of this happening are one in 531,441." Each month of spring (March, April, May) "all ranked as top-ten warm" -- also the first time that's happened. Global Warming According to Scientific Projections. How things panned out vs. 1981 scientific forecasts. IOW, countering Jerome's lies, again. You're welcome. Warning: Jerome is for entertainment purposes only. Not for educational purposes. May cause dizzyness and loss of sense of reality. Side effects include headache from eye-rolling and/or banging head against desk. Love the use of 'massaged' data instead of actual data. The temperature datasets vary, why did they choose UAH do you think for your image, Jerome. Massaging maybe? Where is the massaged data on what I posted? Hansen: We are Past the Tipping Point!! 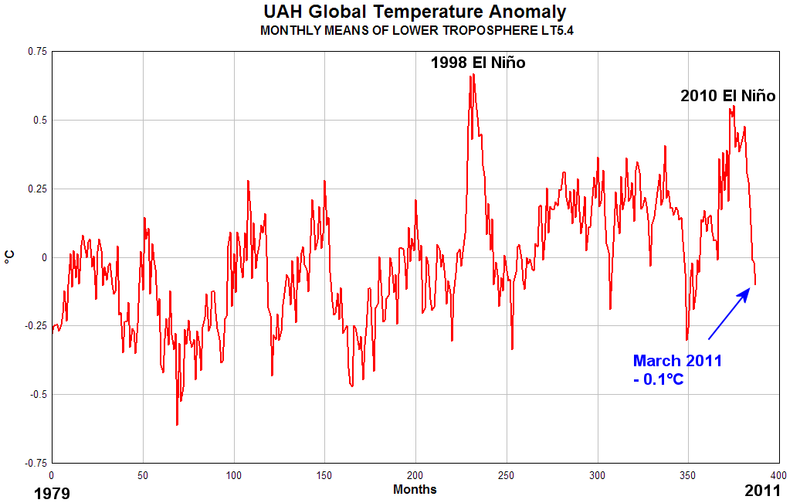 UAH again, which is fine but only one of several organizations that reports such data. Do you know how they calculate their estimates? How will the oceans boil if it is getting cooler? These are not estimates, this is collected data. Last edited by LadyShea; 06-08-2012 at 01:23 AM. Forgive me, How do you think they collect that data? Do you understand the process? If you did, you would understand why I used the word estimate. 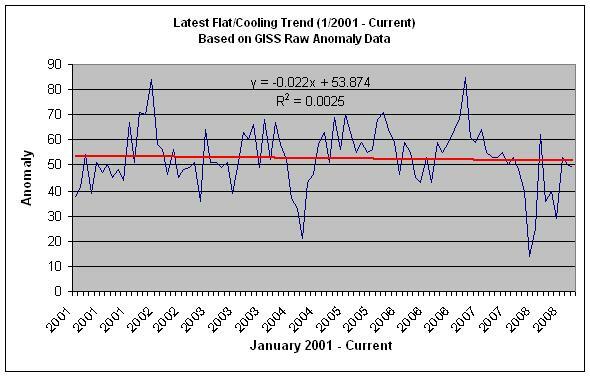 Do you know that it has been cooling for the last decade? Did you know this is contrary to all the predictions over the past 20 plus years? Seriously, Jerome will still argue that everything is fine when he is standing up to his neck in water. I sure hope someone is paying him because nobody should be this much of a useful idiot for the oil industry for free. It's downright unAmerican! lol, jerome is comparing temperature prediction to temperature anomaly. No, it has not. You are a liar. And even if it had been, it doesn't make any difference. Nothing about the global warming predictions demands an unbroken straight line of warming. 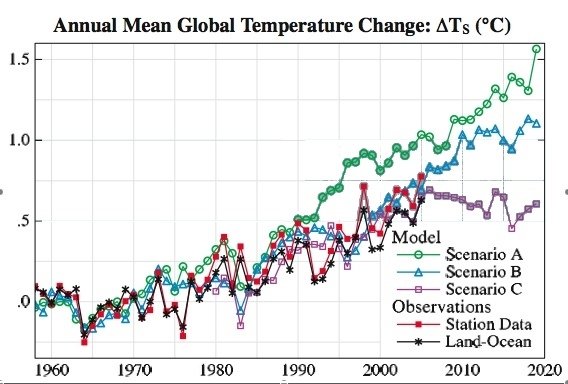 All scientists (which you are not -- you are an asshat) understand that their models are tentative and defeasible, and that there may be future trends which CANNOT be predicted. The sun may unexpectedly cool, for instance, and perhaps that will offset AGW. Nobody knows. Global warming is an overall, long-term trend, which readily incorporates periods of years in which the average temperature declines. So even if it were true that the average temperature of the earth has declined in the last decade, it doesn't matter. The point is we now know beyond any reasonable doubt (which is not the same thing as beyond any doubt whatsoever -- ever sat on a jury, numbnuts?) that humans are warming the globe with potentially catastrophic consequences. Prudent people don't depend on providence under such circumstances, and they don't lie like Jerome. They take preventative measures. We do know that Hansen's 1988 model tends to run a bit hot. Still, characterising scenario A as "emissions as actually occurred" is inaccurate. In that scenario CO2 is within a couple ppm of actual, but other greenhouse gas emissions are way off. See here. Actually, the satellite data requires significant processing. 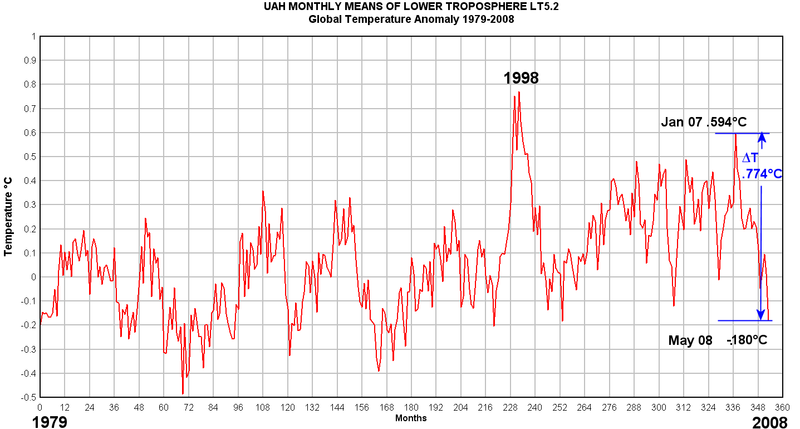 How the UAH Global Temperatures Are Produced « Roy Spencer, Ph. D.